I’d say 90% of the time, if given a choice about dessert, I go with chocolate. Unless there are strawberries. 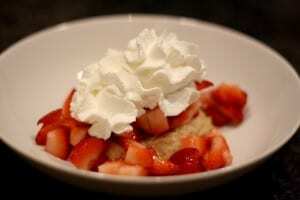 And Strawberry Shortcake is my kriptonite. (The dessert, not the character. Although I did LOVE Strawberry Shortcake the character when I was little. I had a little Strawberry Shortcake action figure that actually smelled like strawberries. She was awesome! I’m sure if you grew up in the 80’s you know what I’m talking about!) 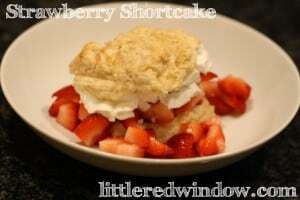 Anyway, most of all I a love shortcake that’s biscuit-y not crunchy or cake-y. When people take a slab of flavorless angel food cake, put strawberries on top and call THAT strawberry shortcake, I cringe. That is so not! It’s wrong! Clearly those people don’t know what they’re missing! 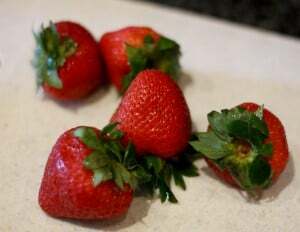 It is a little late in the summer for strawberries, to be honest, but we got some with our grocery delivery that weren’t too bad and we’ve been reading ALOT of The Poky Little Puppy in which four adorable puppies eat strawberry shortcake for dessert. (maybe rice pudding and chocolate custard should be next?) And actually, strawberry shortcake is a great way to use strawberries that maybe aren’t quite perfect. I promise, you’ll like it. 2. Cut the strawberries in to small pieces and put them in a bowl with a lid. 3. 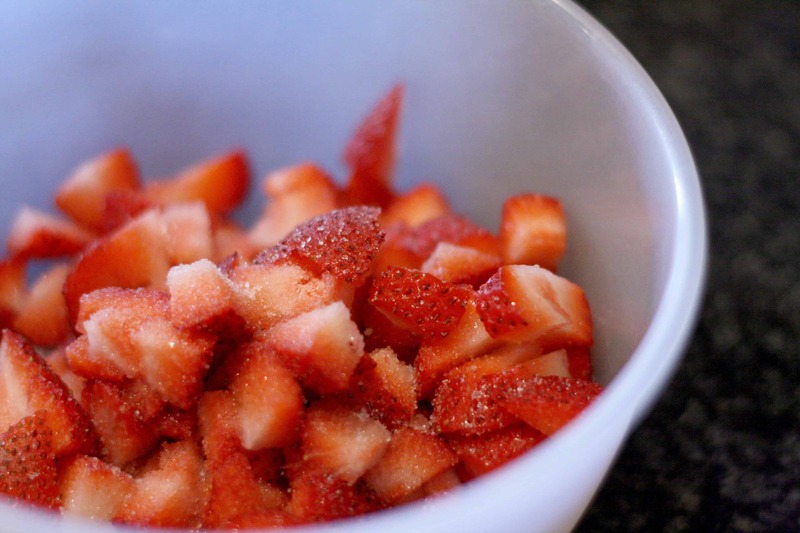 Sprinkle with about a Tablespoon of sugar (more if your berries are tart). 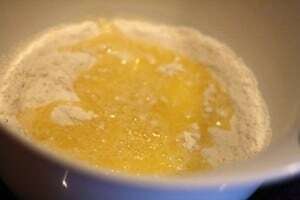 Stir and refrigerate for at least an hour. 4. Preheat your oven to 425 degrees. 5. In a mixing bowl, mix the dry ingredients: flour, salt, sugar, and baking powder. 7. Add the melted butter and the milk to the dry ingredients and mix until combined. 8. Put the dough onto a parchment lined baking sheet divided into four equal biscuits. 9. 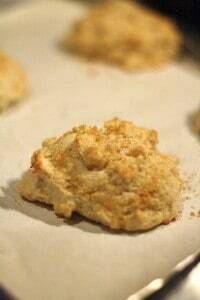 Sprinkle the tops of the biscuits liberally with turbinado sugar. 10. 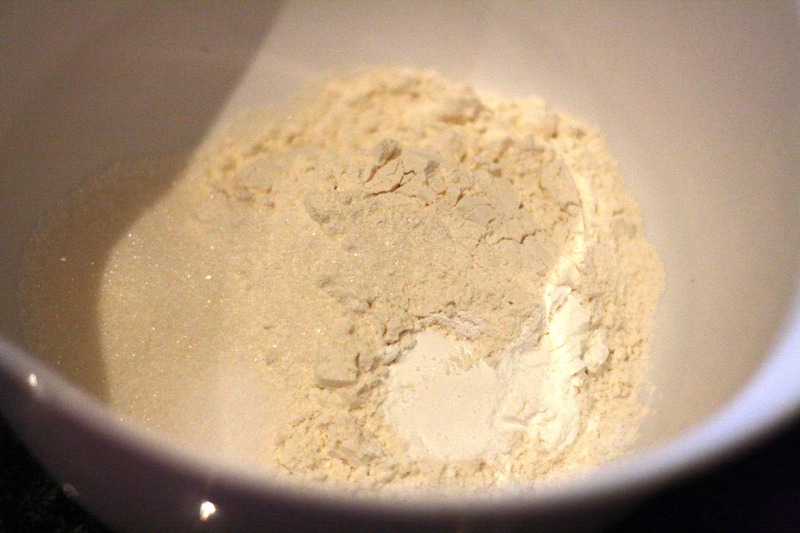 Bake for 11-13 minutes until the tops just start to brown. 11. The hard part: wait until the biscuits are cool enough to touch (at least 15-20 minutes). 12. Split a biscuit in half across and set the top aside. 13. Add strawberries and their juice on top of the biscuit bottom. 15. Add the biscuit top back on.